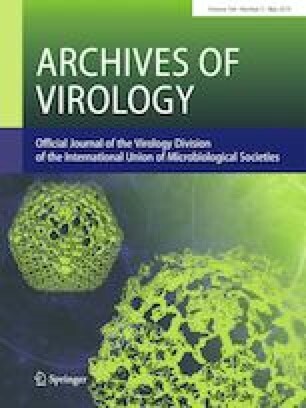 High-throughput sequencing revealed a tentative new badnavirus infecting Codonopsis lanceolata, provisionally named Codonopsis vein clearing virus (CoVCV). The complete 8,112-nt CoVCV genomic DNA sequence (GenBank accession: MK044821) comprises three open reading frames (ORFs) encoding conserved domains, with typical features of badnaviruses. Additionally, BLASTn searches indicated the CoVCV genome sequence is most similar to the grapevine vein clearing virus (GVCV) genome (72% identity and 46% query coverage). Moreover, the polyprotein encoded in CoVCV ORF3 is most similar to the corresponding protein of GVCV, with 60% amino acid sequence identity (89% query coverage). These results suggest that CoVCV is a new member of the genus Badnavirus in the family Caulimoviridae. The online version of this article ( https://doi.org/10.1007/s00705-019-04238-5) contains supplementary material, which is available to authorized users. This study was supported by the KRIBB Research Initiative Program, which is funded by the Ministry of Science and ICT, Republic of Korea. We thank Edanz Group (http://www.edanzediting.com/ac) for editing a draft of this manuscript. This study was funded by KRIBB (Ministry of Science and ICT), Republic of Korea. The dataset generated during the current study is available in the GenBank repository (accession: MK044821).